Dreamchasers is the official representative of the Marathon Des Sables for individuals who reside in the USA. If you are not a resident of one of the USA, please contact the race organizers via their website: OFFICIAL MDS SITE. There are no ‘qualifying’ requirements to enter the Marathon Des Sables. 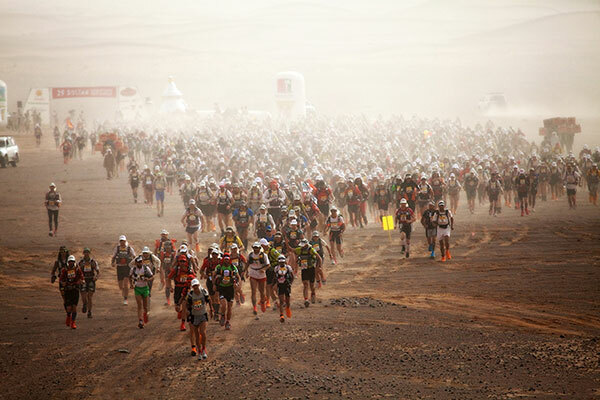 REGISTRATION FOR THE 2019 MDS: Registration for the 2019 Marathon Des Sables is available on-line via the official MDS website: www.MarathonDesSables.com The entry fee of 3,100 Euros is payable via wire transfer only directly to the Head Office in France. It is important to know that the entry fee DOES NOT include airfare. A deposit is due to secure to your spot. A second installment is due by the end of September and the balance of the entry fee is due by January 15, 2019. We suggest that every competitor purchase a trip cancellation policy and thoroughly review the refund deadlines, keeping in mind that the last day to withdraw from the 2019 MDS and receive a partial refund is January 15, 2019. Once you have received a confirmed place in the 2019 Marathon Des Sables, and have paid the initial deposit first installment fees, you will need to complete the official registration documents. via the on-line registration system. With that, all of the registration documents are submitted through the official race website. Payments are made via wire transfer directly to the Head Office in France. RACE REGULATIONS: For those participating in the 2019 MDS, please know that it is your responsibility to review and understand the official race rules and regulations. You can download a copy HERE. The List of 2019 MDS Competitors based in US can be found HERE (posted in late September). The official race roster, with bib numbers, is typically posted to the official race website in late February of each year. Dreamchasers is the Official Marathon Des Sables Representative for the US. The Marathon Des Sables takes place yearly in late March or early April in a remote section of the southern Sahara Desert, south of Ouarzazate, Morocco.